There are schools of thought which believe that light and darkness are opposites and that a battle between the two is part of the way the universe was created. The same people also tend to believe that, while spirit is full of light, all matter – and that includes our physical bodies – is full of darkness and therefore flawed. It all sounds a bit like the idea promoted by medieval-era church teachings – that we are worthless, defective, diseased sinners who need to appease some guy in a pulpit if we are to ever have a chance of putting things right. Darkness and light are not opposites. Bright sunshine is bright light. Shadow is less-bright light. They are both degrees of light, not opposites. The same misconceptions show up in other traditions. Yin and Yang have often been portrayed in ways that are no longer seen to be valid in today’s era of scientific thinking. Yang has been portrayed as the sunny side of a mountain or a river, while Yin is the shaded side. Again, these are just differences in the degree of light. Yin and Yang are not cold and hot, for those conditions are just degrees of the same energy – heat. They are not even positive and negative, for that would imply that they are different poles of the same energy. One thing that three centuries of science has given us is the ability to see things in better definition. Today, we even understand that both heat and light are expressions of the same electromagnetic energy, but at different frequencies of expression. To understand the true nature of Yin and Yang, you have to realize that they are actually different energies. They are both expressions of the energy of the Creator. Without either one, the universe could not exist. Perhaps the best examples of Yin and Yang energies are magnetism and electricity. Magnetism draws objects together while electricity holds the potential to do work. When combined and set into motion, these energies produce physical light – an expression of electromagnetic energy. Yang energy is the energy of expansion. It pushes outward, as if to explore the universe. Yin energy is the energy of balance and harmony. It counter-balances the potential of Yang energy to bring it into a usable form as light. Light is energy in motion. The physical light that we see is just one manifestation of the energy that cascades through the realms of existence, powering all forms of life. Light manifests on all levels – as physical light, as etheric life energy, as mental energy, and as other essential forms of energy. 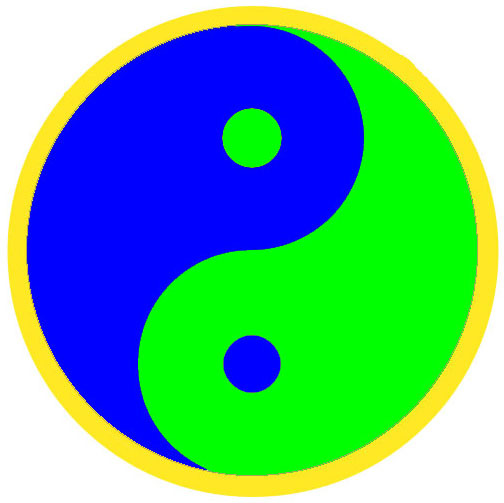 If Yin and Yang are not really darkness and light, then perhaps the colors of the Yin and Yang symbol should not be black and white. We could even get creative! These days, we have colors to use in portraying such concepts. For example, how about the colors of the primary human chakras? Let’s take the chakras of immediate concern to humans – the solar plexus, the heart and the throat chakras. Blue is the color of the throat chakra and its natural resonance with the soul and its unlimited spiritual connection. Blue and spirituality – what a perfect match. Green is the color of the heart chakra and its primary purpose of bringing harmony to human consciousness. Green and harmony – what a perfect match. Yellow is the color of the solar plexus chakra and its focus upon empowering, rational thought rather than the superstition and fear of bygone eras. Yellow, the sunshine color, and empowered energy – what a perfect match. Most of all, in our journey back to conscious connectedness with our souls and the divine, let’s remember that we are deserving of all the light that the Creator sends us each and every minute of every day. This entry was posted in Metaphysics, Owen K Waters, Spiritual Metaphysics on October 14, 2017 by Owen K Waters. Thank you, Owen. I am eager to read this latest edition of your book The Shift. I have the original and have read it several times. Thank you for all your wisdom and insights that have helped me through the years of spiritual growth and understanding. Committed to lifelong learning and spiritual understanding, I am grateful for the Internet allowing you to share your gifts with so many, including me! Thank you!